Stems: Erect, branched above. Plants glabrous or finely pubescent. Leaves: Basal leaves withering early; petiole 1/5 to 4/5 inch; blade spatulate to oblanceolate or oblong, 3/5 to 4 inches long, 1/5 to 4/5 inch wide, margins serrate to pinnately lobed. Cauline leaves: petiole absent or short; blade oblanceolate to linear, 2/5 to 3 inches long, 1/12 to 7/10 inch wide, base wedge-shaped to attenuate, not auriculate, margins entire to serrate or dentate, rarely pinnately lobed. Inflorescences: Racemes, terminal: rachis finely pubescent. Flowers: Sepals 4, oblong to elliptic, tiny; petals absent or if present white, linear, shorter than sepals; stamens 2. Fruits: Silicles, obovoid to suborbicular, 1/7 to 1/4 inch, nearly as wide, narrowly winged distally, apical notched; seeds orange, 1/24 to 1/16 inch. 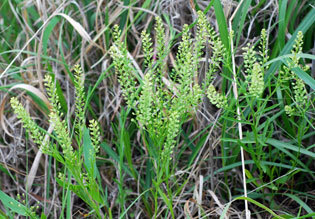 Comments: Lepidium, scale, alluding to the appearance of the fruits and densiflorum, densely flowered.